These folks represent you – local taxpayers -- and they serve on the ICROC, or Independent Citizens Referendum Oversight Committee, for the millage increase renewed by voters in August 2018. Members include (sitting l-r): Jane Moerlie, Narvella Haynes, Diana Williams (vice chair), and Carol Smith; second row (standing l-r): Ed Wilson, Kearsten Angel, Bobbie Gunther, Dr. Mike Gonzalez (chair), and William Richhart; third row (standing l-r): Neil McDonald, Nick Blaser (secretary), Phil Hyde, and Michael Holloway. With this renewal and grateful thanks to Marion County voters, the district expects an additional $18 million each year for the next four years. What will these funds pay for? Additional safe schools measures, teachers - specifically in art, music, physical education, and library media services. Referendum dollars will also help the district meet class size requirements, attract, train, and retain highly-qualified teachers, and help expand vocational programs and services. 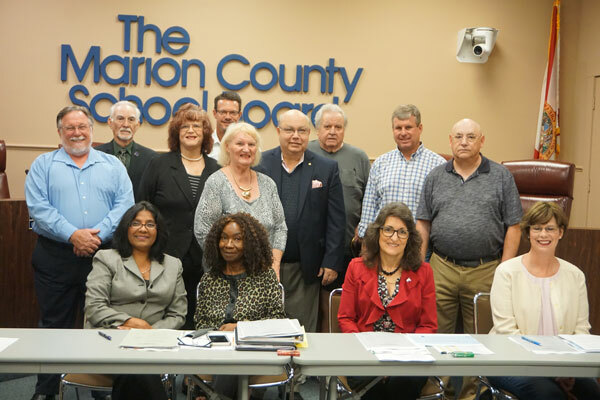 As part of its promise, the Marion County School Board established an Independent Citizens Referendum Oversight Committee (ICROC) to ensure the school district spends these tax dollars as promised. The ICROC committee meets throughout the year and reports directly to the Marion County School Board. Questions regarding ICROC? Please contact Chair Dr. Mike Gonazlez at mgrconsultantsllc@gmail.com.